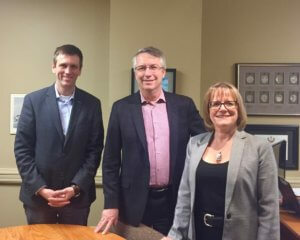 Stonehenge’s Dr. Andrew Ekblad (Board Chair) and Heather Kerr (Executive Director) met with Guelph MP Lloyd Longfield on Jan. 16 to discuss Stonehenge’s programs and the funding received towards the opioid crisis. Lloyd was updated on our new initiatives that include expansion of the Rapid Access Addiction Clinic to two days per week, expansion of our Community Withdrawal Support Service into rural Wellington, our new Peer-led Overdose Response, and planning for the increase of our addiction supportive housing beds. Also discussed was programming opportunities for Indigenous populations. Needless to say, it was a full meeting.